“The future belongs to a different kind of person with a different kind of mind: artists, inventors, storytellers-creative and holistic “right-brain” thinkers whose abilities mark the fault line between who gets ahead and who doesn’t. 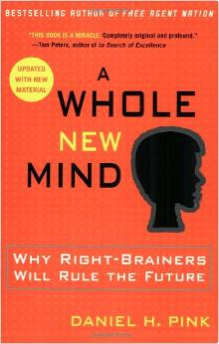 via A Whole New Mind: Why Right-Brainers Will Rule the Future: Daniel H. Pink: 9781594481710: Amazon.com: Books. …but I do think that the likelihood of ending up living with it is the exception and not the rule. Stumbled across this on Pinterest, I believe and it instantly resonated. Color from black and white. 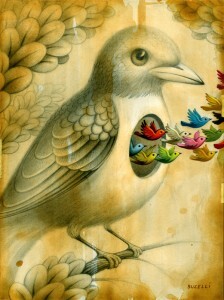 Little seedlings of flight emanating from the heart. Momma love. Taking off on adventure. Did a little digging and found the artist, Chris Buzelli. You can click the picture to get to his website. Also click here to go a really great artists’ hangout I found. One of my anthem songs…wish I could figure out how to get the whole song on here. Love these guys! Go buy their stuff. It started with nose picking. Back from the crisp, dry Central Oregon air, my boogers have taken on a landscape of their own. Now that I am way too mature to actually pick my nose (WHATEVER), I am harkening back to my childhood when nose-picking was quite a hobby. “Don’t pick your nose, Bertha,” used to be what I heard. That was pretty funny—nice family tradition until the beautiful summer day when Mom and I were driving to the grocery store with the windows down. “How are you doing, Bertha,” hollered Mom out the window at one of her bridge buddies standing at the corner waiting to cross. And so named. “Are you the lady that picks her nose?” I hollered after her. Kids are just precious. As organic conversational topics are known to do, this happened to come up with my roommates. They’d also been to Central Oregon and I couldn’t help but wonder if their boogers were under-going a similar metamorphosis. “Have you ever noticed that no matter how big a person’s finger is, it is able to fit up his nostril?” asks one of my roomies. Loved that he put that in the masculine as obviously boys are bigger nose pickers than girls. “I mean have you ever heard someone say, “Gosh, my finger is too big to fit up my nose”? Excellent point. I hadn’t, and did spend a little bit of time searching my archives to make sure I hadn’t missed something. All I could find was that I have also never heard anyone say, “Gosh, there’s wayyy tooo much cheese on that.” Additionally, I have never been able to lick my elbow, though I have tried. “That’s proof of creation right there,” he said. We laughed. Something about farts and boogers can bring that out in adults—at least the kinds of adults I like. I happen to fall squarely in the camp that buys into creation as well, and being one to fixate on frivolous tangents, I spent about a day and a half throwing this post around in my head, amused by it. The fact that an individual’s finger girth to nostril capacity ratio are compatible does present a compelling argument for intelligent design. As this idea rumbled around, and I decided that I would bless my audience with it, I had to bump the vetting criteria up a notch. Would the universal ability to pick one’s nose, in truth, qualify as incontrovertible proof of creation? My reputation is at stake here: I want to be factual and authorized in my pontifications. And actually, no—it doesn’t. If each step of evolution gave the species a better chance at survival then nose-picking would naturally have been a key component in the process.